The stock market is at a point where strong economic growth can hurt it. That’s because any resulting rate hikes from the Federal Reserve could lessen the appeal of equities versus bonds. Goldman Sachs says that companies returning cash to shareholders tend to outperform during these periods of economic expansion. The firm has identified 18 companies it expects to beat the broader market as gross domestic product increases. A robust, growing economy doesn’t always mean a strong stock market. Sure, an expanding economy is a crucial component of the profit growth that drives share prices higher. But at a certain point the Federal Reserve has to step in to make sure conditions don’t get overheated. We’re at that point right now. Investors increasingly having to contend with the fact that strong growth in economic indicators like gross domestic product (GDP) may wind up hurting equities, which are enjoying their longest bull market on record. The reason is straightforward: The Fed will raise rates in order to keep the economy in check, and that will make stocks less attractive compared to their fixed-income counterparts. So what’s a trader to do? Goldman Sachs recommends seeking out companies that return high levels of cash to investors, whether that means through share buybacks or dividend payments. The chart below shows this dynamic in action. 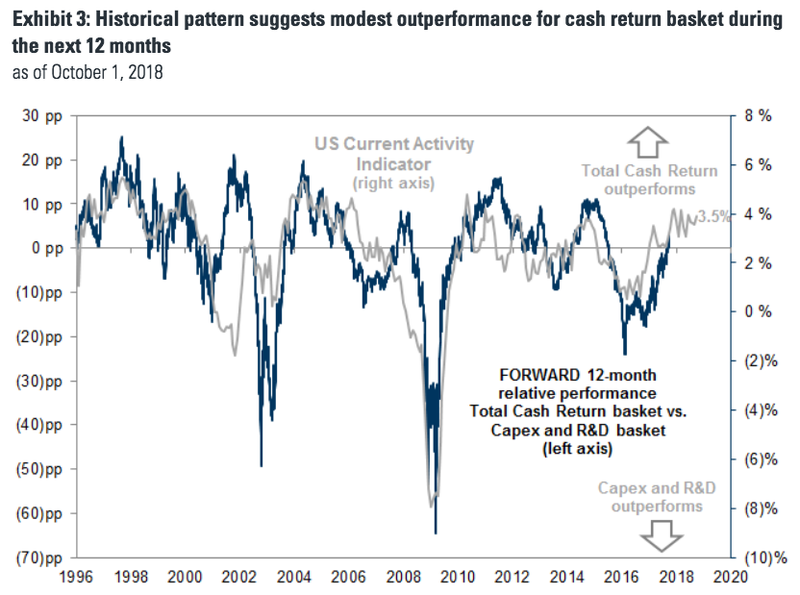 „During strong GDP growth environments, companies returning the most cash to shareholders typically outperform firms investing for future growth,“ a group of Goldman strategists wrote in a recent client note. To make matters even easier for investors, Goldman actually maintains a basket of companies that have offered the highest cash returns over the past year. The firm recommends buying them if you want to make outsized profits as GDP climbs higher. Without further ado, here are the 18 stocks with the highest trailing 12-month combined buyback and dividend yield, ranked in increasing order.